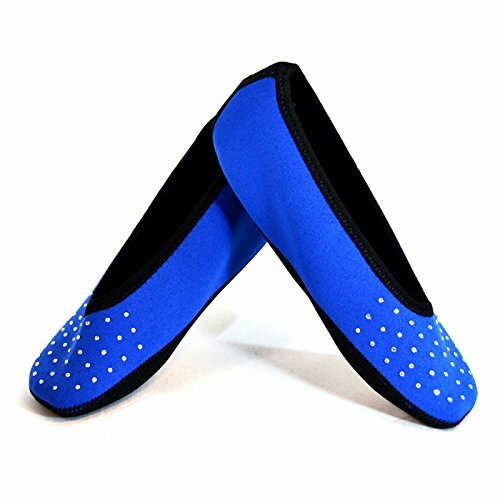 NuFoot Sparkle Ballet Flats Women's Shoes Best Foldable & Flexible Flats Slipper Socks Travel Slippers & Exercise Shoes Dance Shoes Yoga Socks House Shoes Indoor Slippers Royal Blue X-Large by Nufoot at freespiritedfit.com. MPN: 1933. Hurry! Limited time offer. Offer valid only while supplies last. Prepare yourself for the ultimate in indoor comfort footwear. Nufoot Ballet Flats women’s shoes caress your feet while keeping them warm and dry. Prepare yourself for the ultimate in indoor comfort footwear. Nufoot Ballet Flats women’s shoes caress your feet while keeping them warm and dry. Their seamless design prevents irritation and conforms to the natural contours of your feet. Water resistant neoprene construction means no more worries when walking around the house without shoes. Whether traveling through the airport, going to yoga class, showering at the gym, or just having some quite time at home, there is nothing better for your feet than Nufoot! If you have any questions about this product by Nufoot, contact us by completing and submitting the form below. If you are looking for a specif part number, please include it with your message.